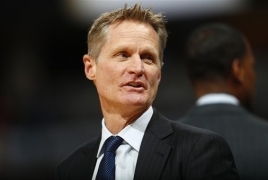 PanARMENIAN.Net - American professional basketball coach and former player Steve Kerr known the story of his grandparents saving thousands of Armenians in the 1920s. But here he was, in a packed banquet room at San Francisco’s KZV Armenian School, feeling the impact of their benevolence like never before, The Atlantic says. Stanley and Elsa Kerr cared for nearly 10,000 orphans when they had nowhere else to go. Many of them went on to become college graduates, experts and professionals. The Kerrs put themselves in grave danger for people they didn’t know. San Francisco Mayor London Breed attended along with Congresswoman Jackie Speier. Vahan Derounian, a mortgage consultant from Wells Fargo, wore Kerr’s blue Arizona jersey on top of his shirt and tie. Anahid Katchian, 74, drove from Denver with her husband. Katchian’s father was one of the orphans. The video of his late father, the images of his grandparents, the interviews with his aunts and uncles — they visibly touched Kerr. He was 10 years old when his grandfather died. He remembers his grandfather being a handyman. Whenever Stanley made the trek from Princeton, N.J., to see his grandchildren in Southern California, he would end up fixing something. Once, they went to the store together to get wood, mesh wiring and nails and Kerr built a rabbit cage with his grandfather. He remembers the kindness of grandmother, Elsa, and how she’d cook for them. He remembers a few of the favorite meals she used to make.